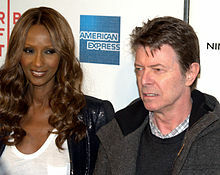 ↑ Iman, Peter Hill Beard, David Bowie, I am Iman, (Universe Pub. : 2001), p.15. ↑ Iman, Peter Hill Beard, David Bowie, I am Iman, (Universe Pub. : 2001), p.11. ↑ Iman, Peter Hill Beard, David Bowie, I am Iman, (Universe Pub. : 2001), p.17. ↑ Iman, Peter Hill Beard, David Bowie, I am Iman, (Universe Pub. : 2001), p.54. หน้านี้แก้ไขล่าสุดเมื่อวันที่ 16 เมษายน 2561 เวลา 20:05 น.